William Martin of NFFE-IAM Local 2109 in Watervliet, NY won first place in the 2011 IAM photo contest for his photo Eagle Eye that shows Kathleen Seeloff conducting a quality-control inspection of a 120mm mortar barrel. Contest winners’ photos will be featured in the 2012 IAM Calendar. 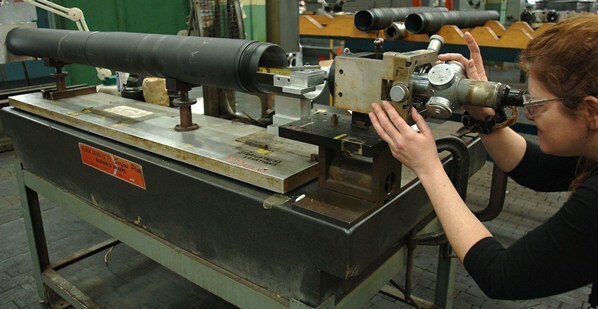 William Martin of NFFE-IAM Local 2109 in Watervliet, NY won first place for his photo Eagle Eye that shows Kathleen Seeloff conducting a quality-control inspection of a 120mm mortar barrel. Peter Ng of Local Lodge 764 in Richmond, BC, Canada, took second place with his photo Safe Start Engines showing Selim Turgut removing a ground power unit from a Dash 8 aircraft. Third place goes to Raymond Pfahler of Local Lodge 31 in Omaha, NE for his photograph Setting the Rotor that shows Gerry Munoz installing a high-pressure rotor into a turbine. Honorable Mention winners include Frank Kammerer of Local Lodge 912; Terry Wasson of Local Lodge 898; John Keisler of Local Lodge 47; Jack Winslow of Local Lodge 174; Benjamin Castic of Local Lodge 41; Scott Orloff of Local Lodge 1725; Darcey Beyer of Local Lodge 1855; Larry Wilson of Local Lodge 733 and Kurt Hannemann of Local Lodge 78. Winning photographs will be included in the 2012 IAM Calendar. Two dollars from each calendar sold are donated to Guide Dogs of America. Click here to download an individual order form. Lodges that want to order large quantities of calendars should click here for the bulk order form.